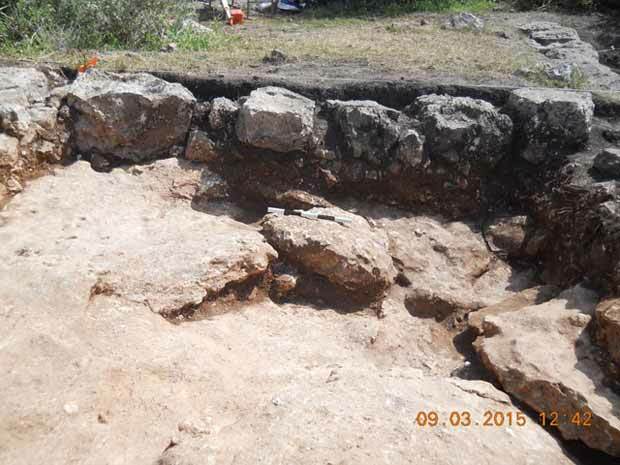 In February–March 2015, an excavation was conducted in Ramat Bet Shemesh (Permit No. A-7341; map ref. 196424-675/623465-603; Fig. 1), prior to construction. 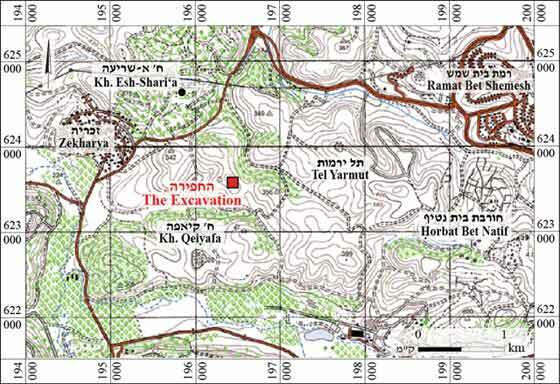 The excavation, undertaken on behalf of the Israel Antiquities Authority and financed by the Ministry of Construction and Housing, was directed by A. Landes-Nagar (field photography), with the assistance of R. Abu Halaf (administration), M. Kunin and M. Cohen (surveying and drafting) and D. Porotsky (plans). Most of the remains were discovered at the top of a moderate hill whose eastern slopes were also excavated. 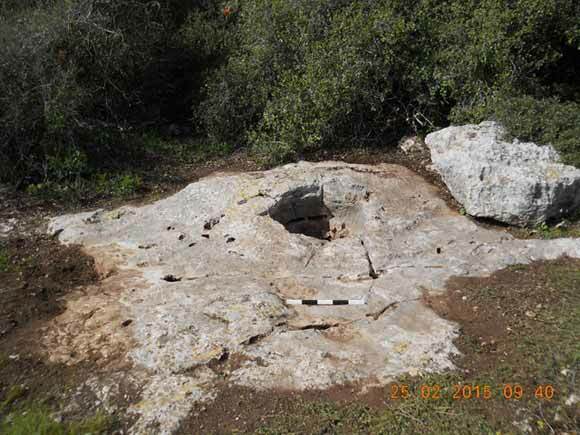 A building, a cave that was used as a charcoal kiln, a field tower and a rock-hewn basin were exposed. 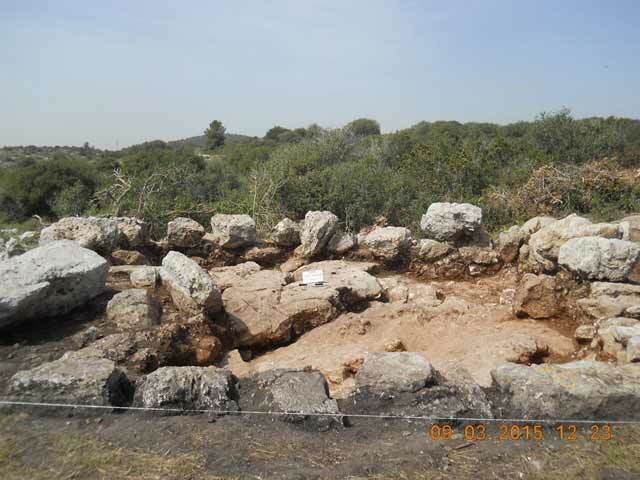 In addition, two stone clearance heaps were excavated. The remains, which were surveyed in the past (License No. S-283/2010), extend over an area of c. 13 dunams (Fig. 2). The building (L103; W1–W3, W5; 6.8 × 7.3 m; Figs. 3–6) was constructed of large fieldstones bonded with soil. It was founded on bedrock and preserved to a height of two courses. Walls 1 and 3 were adjoined by a wall (W6) that was preserved only at its ends, which apparently partitioned the inside of the building into two spaces. The entrance of the building was in its southern part, where four well-hewn architectural elements (A–D), consisting of doorposts (A–C; Figs. 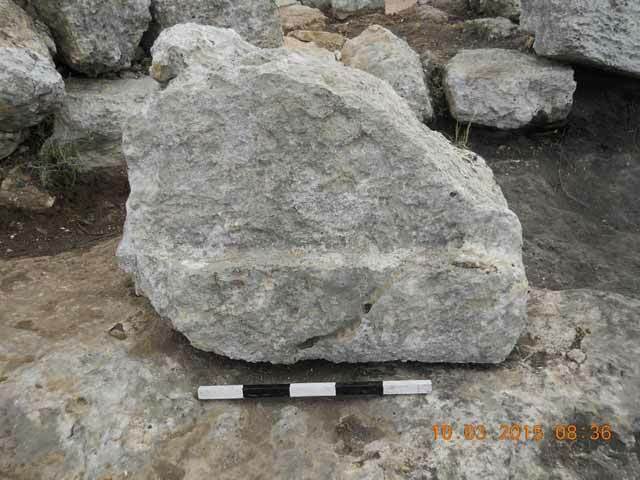 7, 8) and a threshold stone (D; 0.53 × 1.30 m, thickness 0.54 m; Figs. 8, 9), were found lying on the ground. Small fieldstone fill that was probably meant to level the surface was exposed in the southern part of the building. 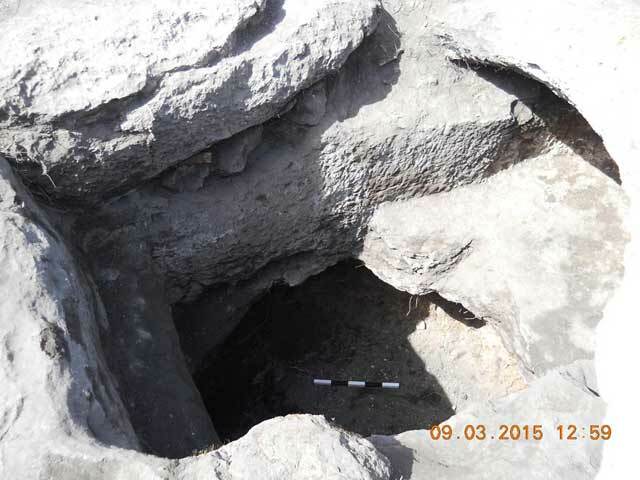 A shallow hewn basin (L109; 0.28 × 0.38 m, depth 0.2 m) was found slightly west of the building. The ceramic finds were scant and contained body fragments and the rim of a Gaza Ware jar dating to the end of the Byzantine period (sixth–seventh centuries CE; not drawn). 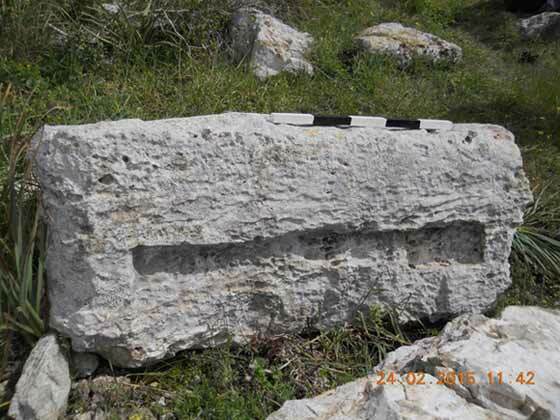 First phase—a hewn rectangular shaft (L111; 1.23 × 2.60 m, depth 2.75 m; Fig. 3) tapered toward the bottom (1.3 × 1.4 m) and led to the cave. A shelf (width 0.8 m; Figs. 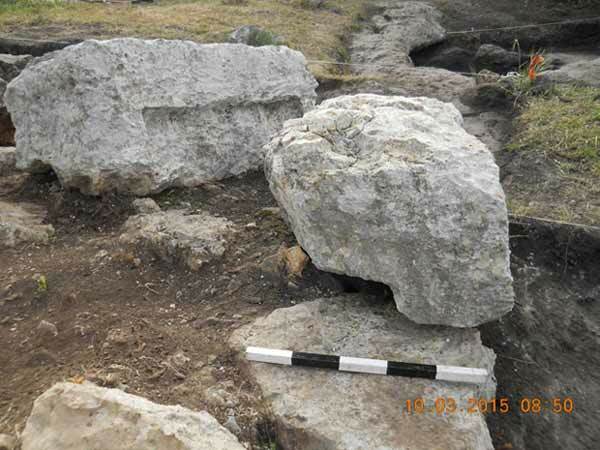 10, 11) was hewn in the northern end of the shaft and a step (width 1.23 m), in its southern end. 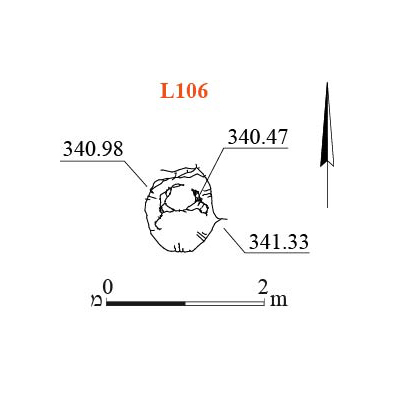 The cave itself was natural and round (L104; height 3.3 × 5.0 m, height 1.7 m). 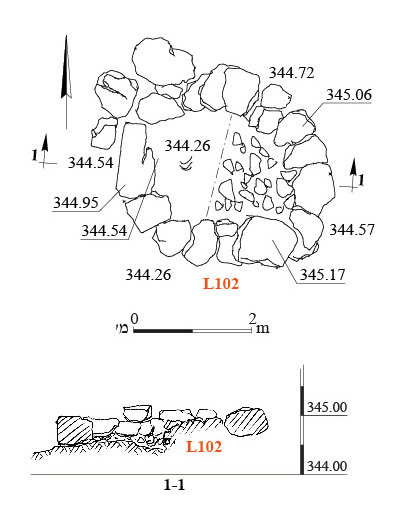 A wall (W7; 0.9 × 1.4 m) of small fieldstones, of unclear purpose, was built along the eastern side of the cave. 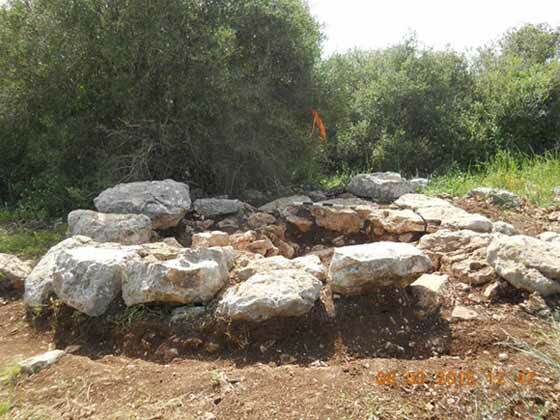 Second phase—based on the charred walls and fill discovered in the cave, in the shaft and in the immediate surroundings, they were apparently used as a charcoal kiln. The fill contained a large amount of charcoal, pieces of wood and a scant quantity of ceramic finds that could not be dated. Soot was also discovered in the southern part of the building, evidence that the charcoal kiln operated after the building was no longer in use. During the first phase, the cave may have been a store room used by the building’s inhabitants. The field tower (L102; 3.45 × 3.65 m; Figs. 12, 13) was round. Its outer face was constructed of large fieldstones and its inner face was fill consisting of small and medium-sized fieldstones. The structure was founded on bedrock and preserved to a height of two courses. 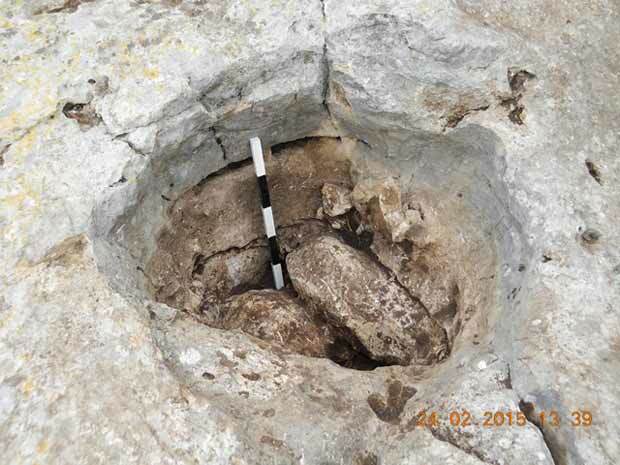 Several fragments of a small cooking pot (not drawn) dating to the Early Roman period were exposed just outside of the field tower. A round rock-hewn basin (L106; 0.60 × 0.87 m, depth 0.82 m; Figs. 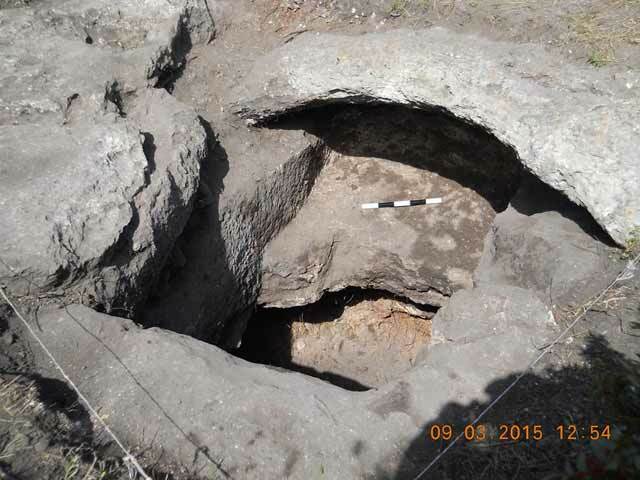 14–16) was discovered c. 35 m east of the field tower. Based on the condition of its bottom it seems that it was incompletely hewn. No datable finds were discovered. 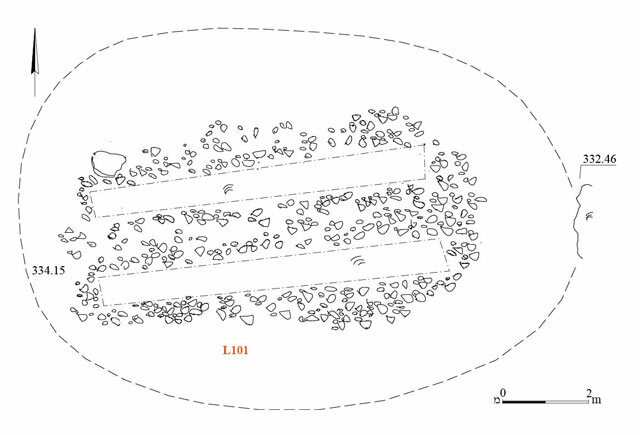 Two adjacent stone clearance heaps composed of small fieldstones were exposed in the southwest of the area (L100, L101); they descended eastward. 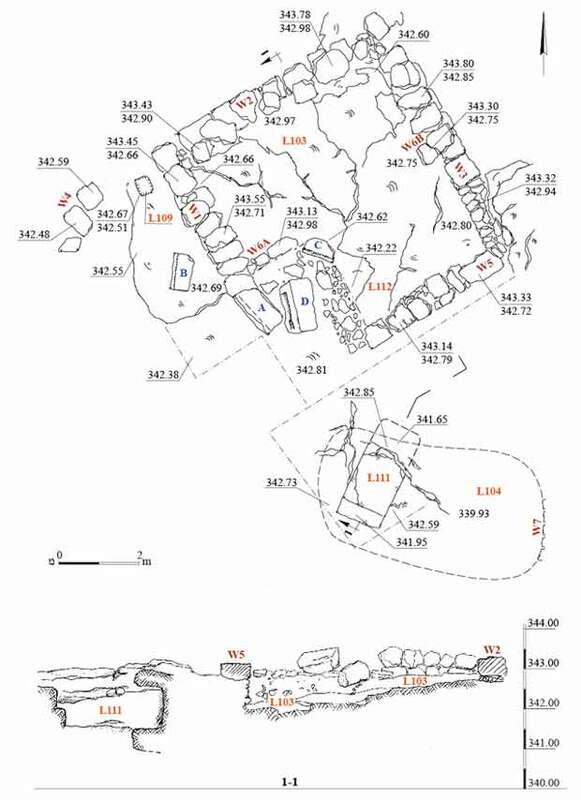 A backhoe was used to dig a trial trench in the eastern heap (L100—11.0 × 13.7 m; Fig. 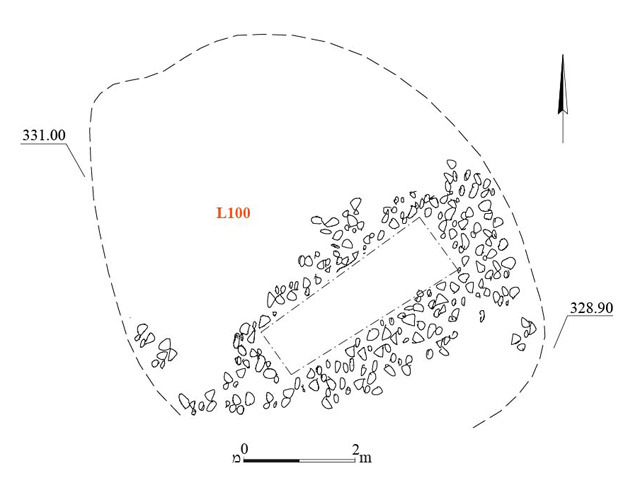 17) and two trenches in the western heap (L101—9 × 13 m; Fig. 18). Bedrock (L100—height 0.7–1.1 m; L101— height 0.2–0.7 m) was exposed at the bottom of the trenches. No datable finds were discovered in the heaps. 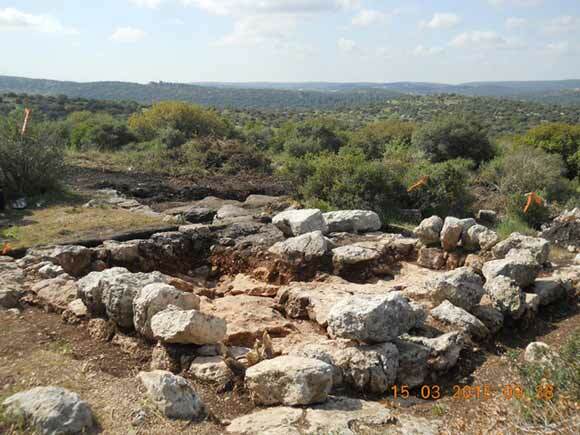 A building, a charcoal kiln and installations indicative of agricultural activity were excavated. The importance of the building lies in its strategic location on a hilltop that commands a view for a great distance. Based on the ceramic finds, the building is dated to the late Byzantine period. Following this phase, a charcoal kiln was installed in a nearby cave. 3. The building and the cave, plan and section. 4. The building, looking south. 5. The building, looking northwest. 6. The inner face of W5, looking southeast. 8. Threshold Stone D and Doorpost A. 10. Shaft 111 and the shelf inside it, looking west. 11. Shaft 111 and the shelf inside it, looking north. 12. Field Tower 102, plan and section. 13. Field Tower 102, looking south. 14. Hewn Basin 106, plan. 15. Hewn Basin 106, looking west. 16. Close-up of Basin 106, looking west. 17. Stone Clearance Heap 100, plan. 18. Stone Clearance Heap 101, plan.